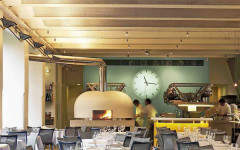 It might take a while to find chef Stevie Parle’s latest offering, Craft London – but the welcome was warm when we recently visited this glass-panelled, cylindrical docking station of a restaurant in Greenwich, overlooking the Millennium Dome. The mission? 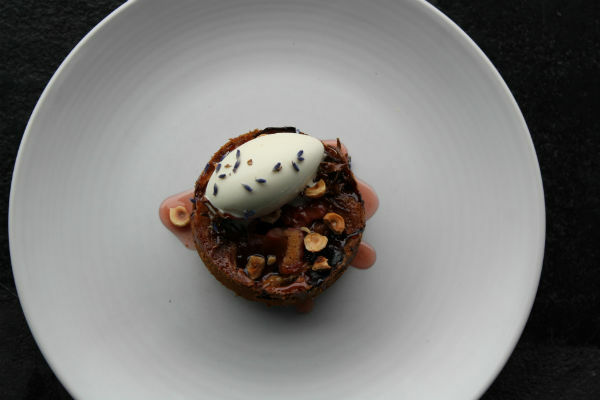 To sample its range of honey-inspired dishes while listening to Parle’s fellow beekeeper Steve Benbow launch his new book, Letters to a Beekeper – a celebration of his friendship with horticulturalist Alys Fowler. 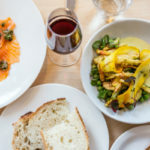 A homage to fresh, rustic produce, the setting is no coincidence: this is a place where bees are kept, fish and meat is smoked and almost everything is harvested, brined, and fermented on site. It’s probably why the entrance has the raw feel of a workshop, with gunny sacks stacked on the sides. 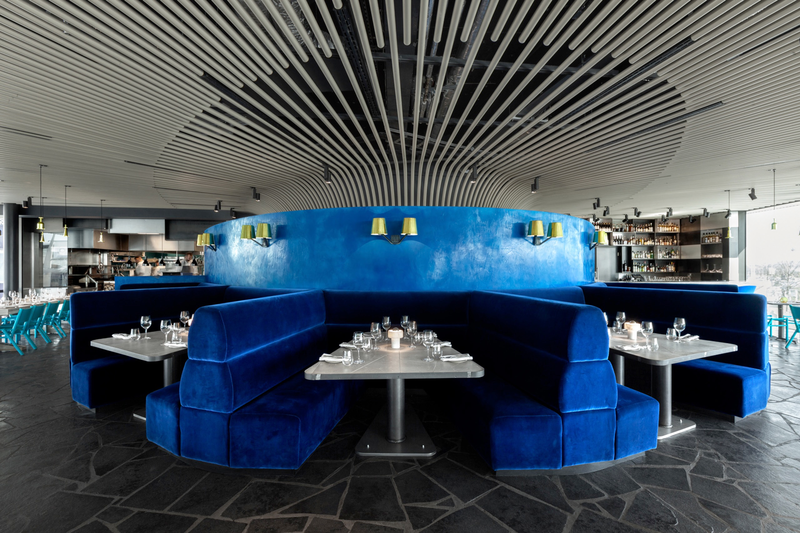 The first floor sports a rather more modern look thanks to décor man Tom Dixon – shades of blue adorn the circular space; misshapen lampshades ooze urban modernism, while radial lines on the ceiling leave the impression you’re under the shade of a large periwinkle mushroom. But it’s the product of the bees and their keepers’ toil we’re here to toast: and we did, with a swig of ‘Bumble’, a refreshing Compass Box Asyla whiskey cocktail with a nectary trail, as I tucked into the amuse-bouche, decorated with drizzles of raw honey. The sweet cured bacon and mustard is a sure favourite – as is the yoghurt and poppy seed, with its tangy, satisfying crunch. The starter arrives: a pile of orange and yellow squash with salad, sea buckthorn, walnut crumbs and homemade feta. The squash is well-cooked, but slightly too carby to my liking. 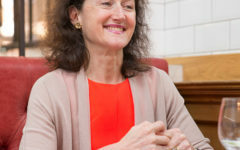 There’s no pleasure to be found in the fatty feta, the bitter salad or the sour seaberry globules either – I longed for more of the delicious moist (yet sadly scarce) dressing with heather honey from Benbow’s own farm. 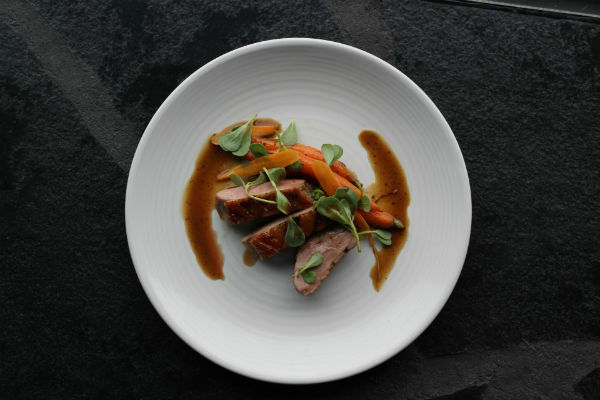 But George Upshall, the sous chef, swiftly redeems himself with the main course: the much awaited fermented honey glazed duck breast, with heritage baby carrot, watercress and jus. My knife slices the meat like butter, while each bite finds more flavour with the glazed coating and the subtle saltiness of jus, washed down gleefully with a glass of American Rhinestone red (a Guardian reviewer proclaimed that she’d swim to Greenwich for Parle’s clay baked duck – though I felt that Upshall’s main course was worth a similar venture to London’s E10). Feeling full but obliged to try dessert, the bakewell tart with cobnut frangipane and bilberry honey jam was scrumptious. Sadly I was forced to leave it half-eaten, merely out of fear of imminent explosion from within. Overall, the honey-themed dinner is a bit of a marmite offering: some will probably find it a bit much, while sweet tooths (like me) will delight. I, for one, will be buzzing right back.